Our Bean Bag Ottomans are versatile, lightweight, and fun. The removable and machine washable zippered outershells are made with heavy hemp canvas in natural color only. 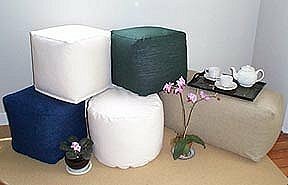 These casual furniture pieces are tightly filled with recycled polystyrene beads that are enclosed in a green cotton fabric with a zippered opening for adding fill if needed. These unique bean bag furniture pieces can be used as ottomans, seats and end tables and can fit in any decor. Cubes are 15" x 15"